2015 has been a messy year for investors as worries about China, emerging countries and the Fed caused volatility and uneven returns across asset classes. Australian shares continued to underperform. 2016 is likely to see continued okay but uneven global growth, low inflation & easy monetary conditions. While the US is likely to raise rates gradually, other countries including Australia remain biased to further easing. Most growth assets, including shares are likely to trend higher, resulting in reasonable returns. But volatility is likely to remain high as the easy gains are well and truly behind us. The main things to keep an eye on are the Fed, China and the ongoing rebalancing of the Australian economy. 2015 has seen another long worry list for investors. Some of these – such as terrorist attacks in Paris, the escalating war in Syria, refugee problems in Europe, Greece’s latest tantrum and tensions in the South China Sea – have not had a lasting impact on investment markets. However, worries about deflation, falling commodity prices, fears of an emerging market (EM) crisis led by China and uncertainty around the Fed’s first interest rate hike have had a more lasting impact. In Australia the focus remained on the rebalancing of the economy after the mining boom as well on property bubbles. While it has not been a bad year for investors, overall returns have been constrained. Constrained global growth. This has been the story for the last few years. Global growth yet again failed to take off being constrained by a combination of a slowing manufacturing sector in the US, another downturn in Japan, a further slowing in China and deep recessions in Brazil and Russia. As a result global growth remained uneven and stuck around 3%. However, while this is causing ongoing skittishness amongst investors it’s not bad. Stronger growth would only bring inflation and interest rate worries. Deflation fears linger. Inflation remained low or fell in developed countries as excess capacity and falling commodity prices continued to impact. Falling commodity prices. The plunge in commodity prices continued as surging supply faced slower demand led by China. Bad news for commodity producers and related investments but good news for most developed countries. Further global monetary easing, but with the Fed diverging. While the Fed moved towards its first rate hike after seven years at zero, lift off was continuously delayed as central banks in China, Europe and Japan continued to ease in the face of sub-par growth and the deflation threat. More geopolitical threats. Terrorist attacks in Paris, the escalating war in Syria and tensions in the South China Sea all caused periodic fear, but without much lasting impact. Subdued growth and more rate cuts in Australia. The mining slump continued to weigh seeing growth remain sub-par. This saw the RBA cut the cash rate to a record low of 2%. But thankfully recession remains elusive as the economy has rebalanced with NSW and Victoria doing well. While global growth remains in a “sweet spot”, its fragility & the associated skittishness of investors – particularly around China, EMs and the Fed – made for a volatile and disparate ride in investment markets. Share markets started 2015 well, as falling inflation & bond yields saw shares revalued only to see them correct under the weight of China/EM/Fed worries, before rebounding somewhat into year-end as such fears faded a bit. In the developed world US shares took a back seat relative to Japanese and European shares which benefitted from easier monetary policy and lower currencies. While Chinese shares had a strong start, they fell back on bubble fears. Emerging market shares performed poorly. Commodities had another bad year as supply surged, Chinese growth slowed and the $US rose. Australian shares underperformed yet again as the slump in commodity prices weighed and as the big banks faced slower growth and higher capital requirements. While the utility, industrial and health sectors did well this was offset by resources, banks and consumer staples. Global and Australian bonds had subdued returns reflecting low yields. Real estate investment trusts and unlisted assets like commercial property and infrastructure had strong returns as investors sought decent sources of income yield. Australian residential property had a good year, but mainly due to house price gains in Sydney and Melbourne. However, gains slowed significantly in the December quarter as official measures designed to slow property investor lending kicked in. Cash rates and bank term deposit returns were poor reflecting record low RBA interest rates. The $A fell another 10% and this helped boost the returns from global shares, once translated into Australian dollars. 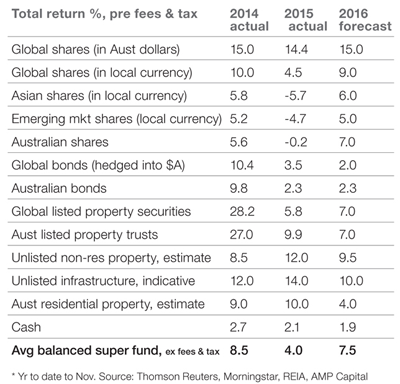 Balanced superannuation funds still exceeded cash and inflation but are on track for their softest returns since 2011. No doubt those who were looking for economic mayhem to break out in 2015, will simply roll their expectations for disaster into 2016. However, there are good reasons to believe we will simply see a continuation of the constrained uneven global growth that we have been seeing over the last few years. Major economic downturns are invariably preceded by either economic or financial overheating and there are no signs of that. There has been no major global bubble in real estate or business investment, inflation remains low, share markets are not unambiguously overvalued and global monetary conditions are easy. In terms of the latter while the Fed is likely to raise rates the process is likely to be gradual reflecting constrained US growth and still low inflation. And monetary easing is set to continue elsewhere, which in turn will also limit the extent of Fed tightening to the extent it puts upwards pressure on the value of the $US. As such, apart from a left field shock, it is hard to see what will drive a major global economic downturn at present. At the same time, it is hard to see what will drive a sharp acceleration in economic growth either. Rather, the structural combination of slower population growth, a more cautious approach to debt and structural problems in the emerging world will keep a lid on global growth. Consistent with this leading growth indicators point to steady growth. Not collapsing, but not booming either. 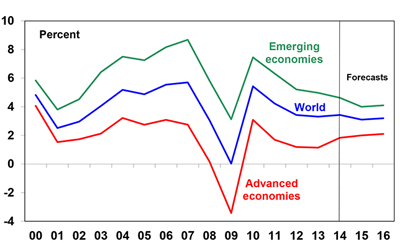 Global growth is likely to be just above 3%, ranging from (hopefully) the tail end of recessions in Brazil and Russia, to around 2.2% in advanced countries, around 4% in emerging countries and 6.5% in China. Inflation is likely to remain low on the back of still significant spare capacity and weak commodity prices. Global interest rates are likely to remain low, with the US raising rates gradually with the Fed Funds rate struggling to make 1% by year end and continuing monetary easing in Europe, Japan and China. For Australia, the economy is likely to continue to rebalance away from mining. However, in the face of a further fall in mining investment, falling national income, a slowing contribution from housing and upwards pressure on bank mortgage rates from increasing capital requirements, further monetary stimulus in the form of more RBA interest rate cuts and a lower $A are likely to be needed. If this occurs then improving conditions in sectors like consumer spending, tourism, manufacturing and higher education should see GDP growth move up to around 3% by year end. At the same time inflation is likely to remain benign. The RBA is expected to cut the cash rate to 1.75% early in the year. The combination of okay global growth, still low inflation and easy money remains positive for growth assets. But ongoing emerging market uncertainties combined with Fed rate hikes and geopolitical flare ups are likely to cause volatility. Global shares are likely to trend higher helped by a combination of relatively attractive valuations compared to bonds, continuing easy global monetary conditions and continuing moderate economic growth. For shares we favour Europe (which is still unambiguously cheap and seeing continued monetary easing), Japan (which will see continued monetary easing) and China (which will also see more monetary easing) over the US (which may be constrained by the Fed and relatively high profit margins) and emerging markets generally (which remain cheap but suffer from structural problems). Australian shares are likely to improve as the drag from slumping resources profits abates, interest rates remain low and growth rebalances away from resources, but will probably continue to lag global shares again as the commodity price headwind remains. Expect the ASX 200 to rise to around 5700 by end 2016. Commodity prices may see a bounce from very oversold conditions, but excess supply for many commodities is expected to see them remain in a long term downtrend. Very low bond yields point to a soft return potential from sovereign bonds, but it’s hard to get too bearish in a world of too much saving, spare capacity & low inflation. Commercial property and infrastructure are likely to continue benefitting from the ongoing search by investors for yield. National capital city residential property price gains are expected to slow to around 3-4%, as the heat comes out of the Sydney and Melbourne markets. The downtrend in the $A is likely to continue as the interest rate differential in favour of Australia narrows, commodity prices remain weak and the $A undertakes its usual undershoot of fair value. Expect a fall to around $US0.60. whether the global economy can finally throw off the worry list and constraints seeing growth perk up.